The concept of ‘god’ in Aztec society is referred to as ‘Teotl’ in Nahuatl, the language of the Aztec. 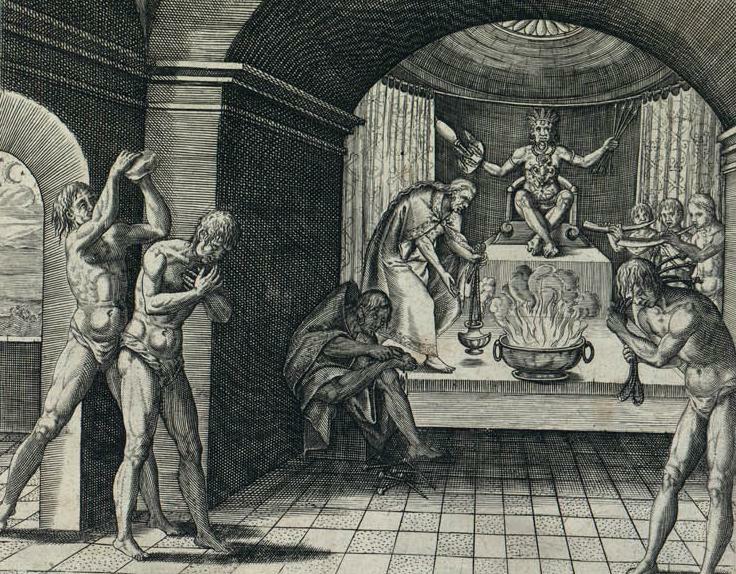 The Aztecs, like other Mesoamerican societies, had a wide pantheon of gods. The gods in the Aztec religion represented different aspects of life and the world for the Aztec people. The aspects that the gods represented included: culture of Aztec society and Mesoamerica, nature and the natural world, creation stories, fertility, food, death and the underworld, trade and excess or entertainment. Each god had different attributes and personality traits and were usually represented in distinct ways by the Aztec. Some could take human or animal form and were celebrated in festivals and rituals. There were many gods in the Aztec religion but some of the most prominent included: Huitzilopochtli, Quetzalcoatl, Tezcatlipoca, Mictlāntēcutli, Tlaloc, and Chicomecōātl. 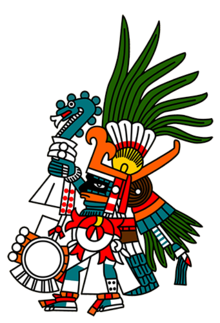 Huitzilopochtli, whose name means ‘left-handed hummingbird’ or ‘southern hummingbird’ was one of the main gods of the Aztec and likely the most prominent. For instance, he was considered the national god of the ‘Mexica’ which is the term the Aztec used to refer to themselves. As well, he was the patron god of the Aztec capital Tenochtitlan. In fact, there was a temple built in his and Tlaloc’s honor in the center of the city called Templo Mayor, which some refer to as the Great Temple of Tenochtitlan. 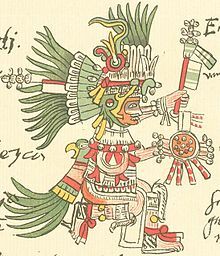 Huitzilopochtli, from the Codex Borbonicus. Huitzilopochtli, from the Codex Telleriano-Remensis. European depiction of an Aztec shrine to Huitzilopochtli. Huitzilopochtli represented several different things for the Aztecs, including: the sun and war. In Aztec tradition Huitzilopochtli was viewed as the sun, his sister the moon, and his brothers the stars. The constant movement of the sun, moon and stars was viewed by the Aztecs as an ongoing battle between Huitzilopochtli and his siblings. Thus, the Aztec believed that they needed to provide tribute to Huitzilopochtli in order to ensure the sun’s survival and ability to ‘fight’ each day. This tribute was usually in the form of human sacrifice, which was a central component of Aztec religious practices. This is because human blood was viewed as necessary for the survival of the gods. Tribute for Huitzilopochtli generally occurred on a festival called Toxcatl which was held in the 15th month of the Aztec calendar. In general, warriors or slaves were sacrificed to honor Huitzilopochtli. Finally, while several different gods represented war for the Aztecs, Huitzilopochtli was the main god of warfare. War and fighting was an important part of Aztec history as it was an important component of the expansion of the Aztec Empire throughout Mesoamerica.